Nebraska held is annual Red-White Spring Game on Saturday and the star of the contest was a 7-year-old boy. 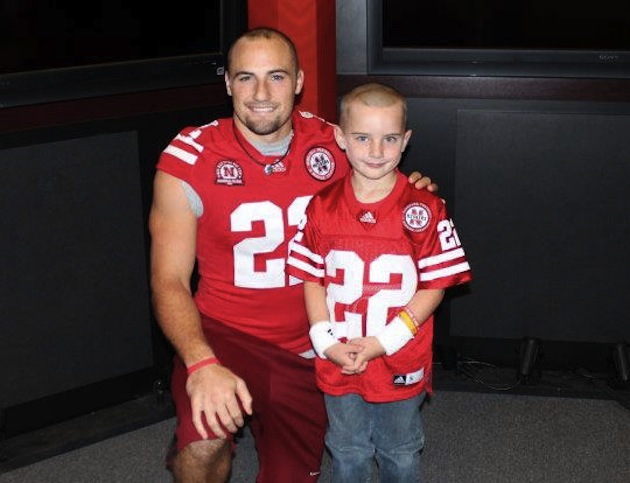 Jack Hoffman is a diehard Nebraska fan battling brain cancer. Last season, he formed a bond with Nebraska running back Rex Burkhead and has become an inspiration for the Huskers ever since. So, during the fourth quarter of the spring game, Hoffman, who was dressed in a Nebraska uniform complete with an oversized helmet (no pads), lined up in the backfield, got the hand off and ran the ball in for a long touchdown. It was the highlight of the game. The Huskers met Hoffman in the end zone and lifted him in the air. He was then greeted by coaches as he returned to the sideline, including coach Bo Pelini, who gave Hoffman an "atta boy" and a helmet tap. What an amazing moment for that young man and a fantastic gesture by Nebraska. It’s getting a little dusty in here.